The 9 is one of Central London's shortest major trunk routes, and always has been, although it traditionally ran a bit further at each end from Mortlake to Liverpool Street via what are now the 209, 9 and 11. Frequency then was by all accounts impressive, with a 3 minute service on offer from Monday to Saturday (referenced 1936). On Sundays it ran every 5 minutes with an intriguing diversion at Bank to Romford over the 5, 15 and 23A, as the 23A did not run on that day. That made it a rather lengthy, with a through running time of just over 2 hours! The section between Becontree Heath and Romford only ran every 10 minutes and was later lost when the 87 was extended to Romford. 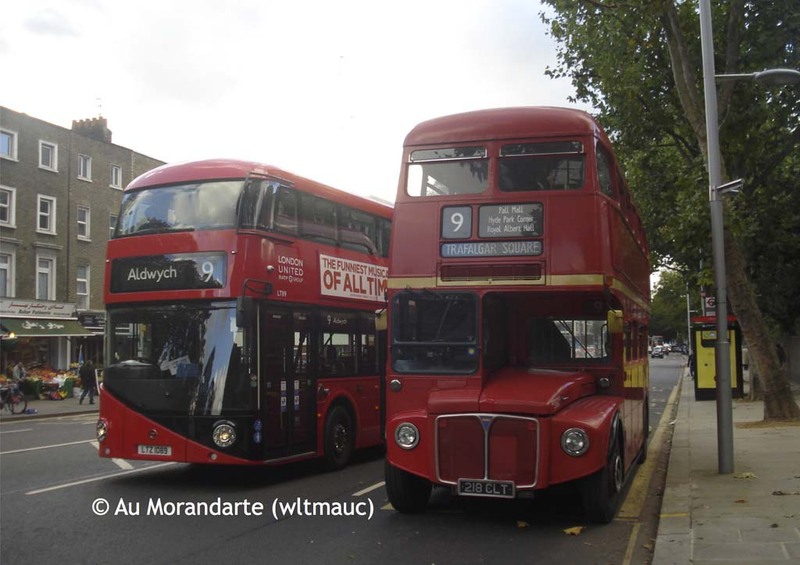 The Sunday 9 extension was finally removed when the 23 gained a Sunday service in the late 1960s, although a token service was maintained as far as Aldgate until 2 PM on Sundays to serve the local markets, the afternoon service being curtailed at Aldwych. The Saturday service was also curtailed to Aldwych a few years later, but the Sunday service was renumbered 9A to avoid the unusual bifurcation, being further diverted via Monument and Tower Hill instead of Bank and Leadenhall Street. This variation had been dropped completely by 1990, and the route thus then ran daily from Mortlake to Aldwych with a Monday to Friday extension to Liverpool Street. The whole route was cut back to Aldwych in the central area changes of July 1992, the replacement to Liverpool Street (also on Mondays to Fridays only until relatively recently) being the 'new' 23. Meanwhile, problems with the bridge at Hammersmith led to the imposition of a severe weight restriction. Double deck buses were thus barred, which created a particular problem for the 9 which would have been totally unsuitable for the small Dennis Darts that were introduced on the other routes crossing the bridge. The 9 was thus curtailed to Hammersmith from early 1992, new route 9A taking over the short section to Mortlake with an overlap as far as Kensington. On Sundays, however, the 9 continued to run right through with Darts, and this pattern was adopted in the evenings also from the end of 1993. In 1997 however, the 9 routing was standardised as Hammersmith to Aldwych daily, while the 9A was replaced by new daily route 209 (Mortlake to Hammersmith only). Traditionally the 9 had been the main route of the little garage at Mortlake (M), which was its terminus, with some assistance from Dalston (D), while Riverside (R) (Hammersmith) and Barking (BK) garages ran on the extended Sunday service. The closure of both M and R resulted in the allocation settling down at Shepherd’s Bush (S) for some years. The 9A was operated from a new base in the London Underground depot in White City, known as Wood Lane (B) but which has since closed again, its allocation absorbed by S. The eventual end of crew operation on 4 September 2004 resulted in transfer of the route to Stamford Brook (V), in an economy swap with the 49. So, this single digit route has had quite an association with single letter code garages over the years! VLE class Volvo B7TLS with East Lancs Myllennium Vyking bodies were used. Since 26 October 2013 the route has been operated by "New Routemaster" (or "New Bus For London") double deckers, also known as "Boris Buses" or "Borismasters," and conductors are once again carried (albeit not evenings or weekends), although their role is primarily to supervise the open platform and they do not sell tickets. 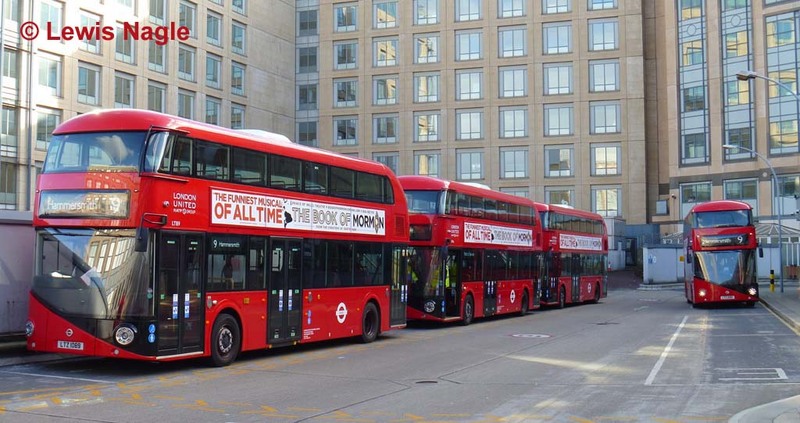 An inmpressive lineup of the buses was found at Hammersmith bus station on the second day, 27 October 2013, with LT89, LT94 and LT90 and one unidentified, all with matching LTZ10xx registrations. The stands here were originally marked out for "real" Routemasters, which were only 9m long compared to the 11.3m of the newer version. The VLEs at 10.5m did just about fit. The length of the buses also means that, after leaving the stand, they need to circumnavigate the whole bus station just to line up properly with the kerb at the stop – not that this tends to happen! To get a photo along the line of route we have this picture of LT89 (LTZ 1089) on 29 October 2013 passing Tower Transit RM1218 also on the 9 – both crewed buses – at Kensington, near the Warwick Gardens bus stop, on 29 October 2013. For an explanation of this, read on! However, it certainly allows a comparison to be made. The New Routemaster may have an open rear platform (sometimes), but there the similarity with the original Routemaster ends. The New Routemaster certainly has a strikingly different design – but you cannot design an icon, and the "real" Routemaster was very similar to other buses in service at the time it was built. Its iconic status comes from the fact that it remained in service so long after later generations of bus had been scrapped, so that the differences between it and other buses gradually became greater over time. To assuage media coverage given to the withdrawal of London’s classic Routemaster fleet, London Mayor Ken Livingstone promised to introduce a "heritage" Routemaster operation. After wild hopes that this would be operated commercially (despite the insistence of standard fare/pass acceptance), the operation eventually materialised as tendered short workings on two existing routes, and one of those was the 9. Buses initially ran between Royal Albert Hall (although the first pick-up is actaully some distance further east) and Aldwych, where they briefly overlapped with the other Routemaster operation, on route 15 between Trafalgar Square and Tower Hill. There was speculation that that Mayor and/or TfL did not want the routes to be a success, and certainly the limited nature of the operation and lack of publicity lent itself to that theory. However, the official line was that the Routemasters, not being Disability Discrimination Act compliant, could only be operated as short workings, so that a low floor alternative is always available. The DDA does not actually come into effect for older vehicles until 2017, but the Mayor self-imposed a 2006 deadline. Each route needs 5 buses in service, with 3 operational spares and 2 in reserve. Nonetheless the routes did start on Monday 14 November 2005 (not the usual Saturday start date, so as to keep clear of the Remembrance Sunday parades), in time to give a healthy overlap with the last "proper" operation on the 159. The 9 short workings were awarded to First Centrewest which ran them from Westbourne Park garage. Purists would detect a number of non-authentic features – indeed, apart from the general shape, there is very little left of the original following refurbishment in the early 2000s! However, the buses were turned out immaculately in red with traditional London Transport logos and cream relief, and certainly looked the part. Authentic silver on black number plates are a nice touch. Further developments may have undermined the heritage operation on the 9. Ongoing reliability problems led to a decision, when the contract was renewed in 2011, to alter the 9 heritage journeys to run from Kensington High Street to Trafalgar Square, taking it even further west away from the main tourist areas. The service was also reduced from 4 to 3 buses an hour. Next, Transport for London undertook a major scheme to return Piccadilly and Pall Mall to two-way traffic, and decided that it wanted a bus to run along Pall Mall as a result (all buses had previously used a contra-flow bus lane in Piccadilly). The 9 was the most obvious choice as, unlike the other Piccadilly routes, it turned south at Piccadilly Circus anyway. The new routeing is certainly somewhat quicker, but there is actually only one pair of stops along the new routeing, and not exactly a huge level of demand! The change does however mean that the major tourist objective of Piccadilly Circus is no longer served. Finally, the introduction of New Routemasters on the main 9 service led to the rather interesting situation of both "old" and New Routemasters running on the 9 at the same time, as illustrated above, both using conductors, but not at the same times! It was not a huge shock therefore when TfL announced its intention to withdraw Routemasters from the 9, leaving the 15 to continue this function alone, serving as it does more of the core tourist areas such as St. Paul's and the Tower of London. This duly occurred after operation on Friday 25 July 2014.